CeraVe cream is formulated for areas of very dry skin. Thicker than lotion, the manufacturers claim it provides moisture; protects the skin; and is noncomedogenic, nonirritating and fragrance free. CeraVe Moisturizing Cream has 23 ingredients and is touted as preventing moisture loss and helping the skin regenerate. Purified water is the first ingredient in CeraVe Moisturizing Cream. It adds moisture to the skin instantly for immediate relief. Glycerin, a fat-based emollient, draws moisture from the air and imparts it into the skin, as outlined in “Milady's Dictionary of Skin Care and Cosmetic Ingredients.” Capric/caprylic stearic triglyceride moisturizes and conditions the skin. Capric/caprylic stearic trigylceride is a chemical compound synthesized from coconut oil. 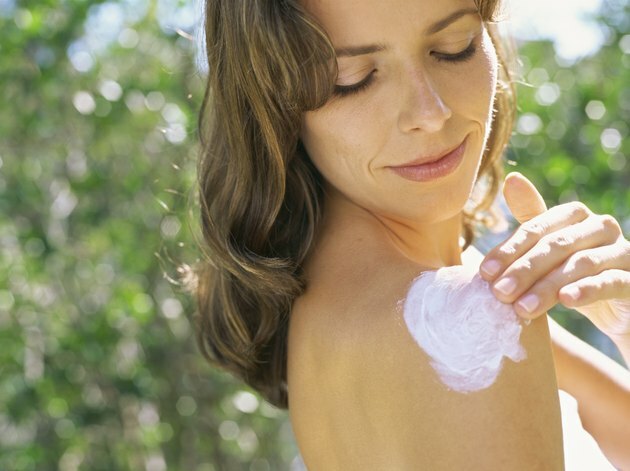 Cholesterol, a thickening agent and moisturizer, draws moisture to the skin and keeps it there. Petrolatum is listed as an ingredient and is also known as petroleum jelly or soft paraffin. A byproduct of gasoline refinement, petrolatum forms a protective barrier on the skin to keep moisture sealed inside. Dimethicone is a silicone-based emollient. Potassium phosphate works to ease the irritation of dry skin. It acidifies the skin and allows the moisturizers to easily penetrate the skin. CeraVe Moisturizing Cream lists xanthan gum as another moisturizer. In addition to providing moisture, xanthan gum keeps the oils and water-based substances in CeraVe Moisturizing Cream from separating during its shelf life. Preservatives keep potentially harmful microorganisms from forming in the product. CeraVe Moisturizing Cream uses methylparaben and propylparaben to keep bacteria, fungi and other organisms from taking up residence in their product. Phenoxyethanol is a bactericide, killing bacteria as they form, according to “A Consumer's Dictionary of Cosmetic Ingredients.” Emulsifiers used in CeraVe Moisturizing Cream include behentrimonium methosulfate/cetearyl alcohol, cetearyl alcohol, dipotassium phosphate, carbomer and sodium lauroyl lactylate. True to the manufacturer's claims, CeraVe Moisturizing Cream includes ingredients purported to help skin cells regenerate to form a healthy barrier. Ceramides 6 11, 3 and 1 are included in the ingredients listing for CeraVe cream. Phytosphingosine is an ingredient included to help activate the ceramides and coerce them to replenish damaged skin cells as outlined in “Cosmetics Unmasked.” Ceteareth-20 and disodium EDTA serve to help the cream penetrate the skin, while hyaluronic acid plumps and irritates the skin to give it a firm, soft feeling and appearance. What Are the Benefits of Hyaluronic Acid for Skin?